Baby Bald Eagles are taken from their Manitoba, Canada birthplace family nest to Dividing Creek New Jersey 1986. The eagles were tagged, nested, and monitored as part of the NJ States Fish Game and Wildlife Bald Eagle Project. First Place NJPA Picture Story by Stanley Brick. (c)2019. The Division of Fish and Wildlife’s Endangered and Nongame Species Program (ENSP) biologists, Conserve Wildlife Foundation (CWF) staff, and volunteer observers located and monitored bald eagle nests and territories. Two hundred-four nest sites were monitored during the nesting season, of which 185 were documented to be active (with eggs) and 19 were territorial or housekeeping pairs. Thirty new eagle pairs were found this season, 20 in the south, nine in central and one in the north. One hundred-twenty-one nests (66%) of the 182 known outcome nests produced 172 young, for a productivity rate of 0.94 young per active/known outcome nest. The failure rate was well above average with 61 nests (33%) failing to produce. The Delaware Bay region remained the state’s eagle stronghold, with roughly half of nests located in Cumberland and Salem counties and the bayside of Cape May County. The state’s eagle population would not be thriving without the efforts of the dedicated eagle volunteers who observe nests, report sightings, and help protect critical habitat. Introduction Historic records are incomplete, but one study indicated New Jersey hosted more than 20 pairs of nesting bald eagles in the Delaware Bay region of the state (Holstrom 1985). As a result of the use of the pesticide dichloro-diphenyl-trichloroethane, commonly known as DDT, the number of nesting pairs of bald eagles in the state declined to only one by 1970 and remained there into the early 1980s. Use of DDT was banned in the United States in 1972. That ban, combined with restoration and management efforts by the Division of Fish and Wildlife’s Endangered and Nongame Species Program (ENSP), resulted in population increases to 23 pairs by 2000, 48 pairs by 2005, 82 pairs by 2010, and 150 pairs by 2015. ENSP recovery efforts – implemented since the early 1980’s – have resulted in a steady recovery as New Jersey’s eagle population has rebounded from the edge of extirpation. Recovery efforts were multifaceted. In 1982, after New Jersey’s only remaining nest (located in Cumberland County’s Bear Swamp) had failed at least six consecutive years, ENSP biologists removed the egg for artificial incubation at Patuxent Wildlife Research Center in Maryland, and fostered the young nestling back to the nest. As a result of residual DDT contamination, the Bear Swamp eggs were too thin to withstand normal incubation. Artificial incubation and fostering chicks continued with success until 1989, when the female of the pair did not return and a new, younger female was able to hatch eggs without intervention. New Jersey Bald Eagle Project Report, 2018 4 Increasing the production from a single nest, however, was not enough to boost the state’s population in a reasonable period of time. Mortality rates are high in young eagles (as high as 80%), and eagles do not reproduce until about five years of age. ENSP instituted a hacking project in 1983 that resulted in the release of 60 young eagles in NJ over an eight-year period (Niles et al. 1991). These eagles contributed to the increase in nesting pairs observed after 1990. Bald eagles nesting in NJ face many threats, with disturbance and habitat loss the greatest threats in our state. In addition, contaminants in the food web may negatively affect the eagles nesting in some areas of NJ. Disturbance is defined as any human activity that causes eagles to change their behavior, and takes many forms, including mere presence of people in nesting or foraging areas. In general, people on foot evoke the strongest negative reaction (Buehler 2000). When eagles change their behavior in reaction to people, they cease doing what is best for their survival and the well-being of their eggs and young. Ultimately, that reduces the survival of individuals and the population. ENSP biologists work to manage and reduce disturbance in eagle habitats, especially around nest sites. A corps of experienced volunteer observers, as well as education and safe viewing areas, are essential to this effort. Viewing eagles from safe distances, where eagles continue to act normally, is best for eagles and satisfies our natural desire to see them. Biologists also protect habitat in a variety of ways, including working with landowners, land acquisition and management, and applying the state’s land use regulations. ENSP has a history of investigating the impacts of organochlorines and heavy metals in eagles and other raptors nesting in the Delaware Bay region. Bald eagles, ospreys, and peregrine falcons nesting in the region have exhibited some reproductive impairment relative to other areas (Steidl et al. 1991, Clark et al. 1998), but recent research indicates problems may be limited to very local areas of contamination (Clark et al. 2001). ENSP biologists collect samples that allow monitoring of contaminants in eagles during the nesting season, and monitoring nest success is an integral part of this research. ENSP biologists, with the Division’s Bureau of Law Enforcement staff and project volunteers, work year round to protect bald eagle nest sites. However, with increasing competition for space in the most densely populated state in the nation, it is clear that critical habitat needs to be identified and, where possible, protected. Critical habitat for eagles includes areas used for foraging, roosting and nesting, and is included in the program’s Landscape Project mapping of critical wildlife habitats. Landscape Project mapping is identifies suitable habitat that is associated with nests, foraging areas, and documented communal roosts. The population of wintering bald eagles has grown along with the nesting population, especially in the last ten years. The NJ Eagle Project discontinued Mid-winter eagle surveys, but has expanded surveys to document important roosting areas in winter and year-round. The federal government removed the bald eagle from its list of Endangered Species in August, 2007, in recognition of the national resurgence in the eagle population in the lower 48 states. The U.S. Fish and Wildlife Service oversees a 20-year monitoring period (through 2027) to watch for and investigate any problems that could compromise the eagle recovery. In addition, a revised version of the Bald and Golden Eagle Protection Act remains in effect to protect nest and New Jersey Bald Eagle Project Report, 2018 5 roost sites for bald eagles nationwide. The bald eagle’s official New Jersey status remains stateendangered for the breeding season and state-threatened for the non-breeding season, and state regulatory protection remained unchanged by the federal action. Objectives of the New Jersey bald eagle program: 1) monitor the recovery of the bald eagle in the state by documenting the status, distribution, and productivity of breeding bald eagles in NJ; 2) enhance nest success by protecting bald eagles and their nest sites; 3) monitor wintering areas and other concentration areas and plan for their protection; 4) document locational data in the Biotics database and apply it to identify critical habitat using the Landscape Project mapping; 5) provide information and guidance to landowners and managers with regard to bald eagles on their properties; 6) increase our understanding of bald eagle natural history in New Jersey. Methods Nest Survey All known nest sites are monitored January through July or through fledging. Volunteer observers watch most nests from a distance of 1,000 feet, using binoculars and spotting scopes, for periods of two or more hours each week. Observers record all data including number of birds, courtship or nesting behaviors, incubation, feeding, and other parental care behaviors that provide essential information on nesting status. ENSP or CWF staff contact volunteers weekly with an update and are available to discuss observer questions and data. Dates are recorded for incubation, hatching, banding, fledging, and, if applicable, nest failure. A nesting territory is considered “occupied” if a pair of eagles is observed in association with the nest and there is some evidence of recent nest maintenance. Nests are considered “active” if a bird is observed in an incubating position or if eggs or young are detected in the nest. Observers report other bald eagle sightings to ENSP or CWF biologists, who review the information for clues to potential new nest locations. ENSP staff and volunteers investigate territorial bald eagles for possible nests through field observations. When evidence suggests a probable location, biologists may conduct aerial surveys of the region to locate a nest. Following guidance from the US Fish and Wildlife Service’s post-delisting monitoring plan (USFWS 2009), we maintain a list of occupied nests and territories for population monitoring. When necessary, nests are protected from disturbance with barriers or posted signs. Staff works in partnership with landowners and land managers to cooperatively protect each nest. Volunteers notify ENSP staff immediately if any unusual or threatening activities are seen around the nest site. The Division’s Bureau of Law Enforcement conservation officers act to enforce protection measures as needed, and provide routine assistance as well. At select sites, ENSP biologists enter the nest site to band young when nestlings are between five and eight weeks old. A biologist climbs the tree and places nestlings into a large duffel bag and New Jersey Bald Eagle Project Report, 2018 6 lowers them, one at a time, to the ground. A team records measurements (bill depth and length, eighth primary length, tarsal width, and weight) and bands each eaglet with a federal band and a green state color band with an alpha-numeric code. A veterinarian examines each bird and takes a blood sample for contaminant analysis. Blood is collected and stored following techniques in Bowerman et al. (1994). Samples are stored frozen pending analysis by a technical lab. Nest trees are generally not climbed the first season to avoid associating disturbance with the new site. Winter and Roost Surveys In recent years, we in New Jersey did not participate in the National Mid-Winter Eagle survey held in January. As eagle numbers have increased in NJ we found that the standardized count no longer covered all important eagle areas, and that volunteer efforts could be put to better use. Biologists asked eagle project volunteers to search for locations where eagles roost and otherwise concentrate in the winter months of January and February. In 2018, volunteers conducted surveys at a dozen known roosts on a quarterly basis, to confirm roost locations and measure eagle use at different times of the year. Those results will be part of the Biotics database documentation. Results Nest Survey The statewide population increased to 204 territorial pairs in 2018, a slight increase from 178 last year. One hundred eighty-five pairs were known active (meaning they laid eggs), thirty-two more than last year (Figure 1); 19 pairs maintained nest territories but did not lay eggs. One hundred twenty-one nests (66%) were known to be successful in producing 172 young, for a productivity rate of 0.94 young per known-outcome/active nest, which is in the range of 0.9 to 1.1 young per nest for population maintenance. Sixty-one (33%) nests failed to fledge young, a rate that is above average for New Jersey. We documented nest failures and brood loss that occurred as 194 chicks were reported at active nests, but only 172 fledged. The number of young lost could be higher as monitors can’t always see the number of chicks in the first few weeks. 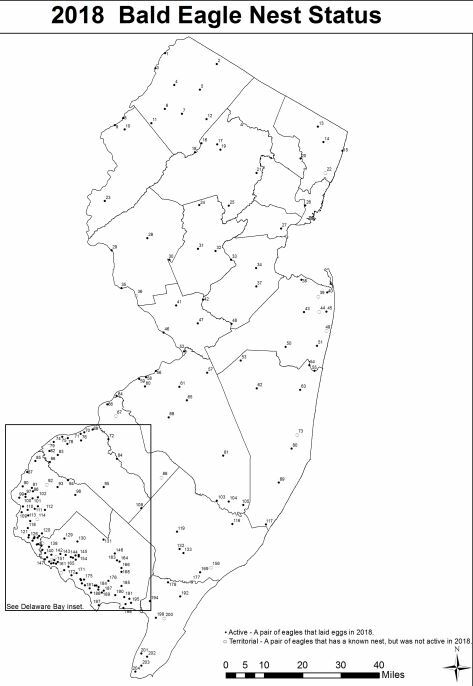 Most nests were located in the southern portion of the state, particularly within 20 km of Delaware River and Bay (Figure 2). The majority of nests were located on private land, while the rest were on state, federal, county, and conservation-dedicated lands. Disturbance was a management issue at many nests, and posting and regular surveillance by staff and nest observers remained essential to increase the chance of success. All documented nests and significant dates of the nesting season are listed in Table 1. Excluded from our nest table are 42 previously documented nest sites that were unoccupied and where no new nest could be found, or search effort was lacking (Table 2). Figure 1. 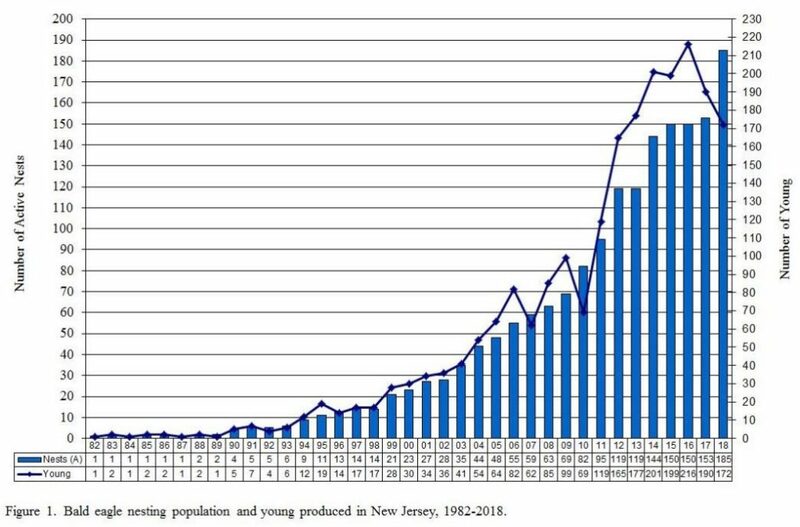 Number of bald eagle nests and young fledged in New Jersey, 1982–2018. Blue bars = number of nests, and blue lines = number of young produced each year. In 2018, 185 pairs were active and 172 young were produced. 001 Minisink Island 052 Crosswicks Creek 103 Mullica River 154Cohansey CC B 002 Bassetts Bridge 053 Prospertown 104 Wading River 155 Tindalls Island 003 Dingmans Ferry 054 Manasquan River 105 Ballanger Creek West 156 Patcong Creek B 004 Culvers Gap 055 Brielle 106 Supawna Meadows A 157 Hancock B 005 Lewisburg-Wantage 056 Burlington Island 107 Fenwick Creek 158 Tindall’s Island B 006 Little Swartswood 057 Jacobstown 108 Cedar Lake (Gloucester) 159 Cohansey (Ragged Island) 007 Hyper Humus 058 Edgewater Park 109 SFE Tower 160 Cohansey (Middle Marsh C) 008 Poxono Island 059 Delanco 110 Salem (Chestnut) 161 Cohansey (Middle Marsh A) 009 Tocks Island 060 Rancocas Creek A 111 Keasbey’s Creek 162 Cohansey (Tindall’s Landing) 010 Yards Creek 061 Fairgrounds 112 Quinton 163 M.R. (Millville) 011 Stillwater 062 JB Lakehurst 113 Elsinboro 164 M.R. (Peeks Preserve) 012 Newton Reservoir 063 Kettle Creek 114 Alloways Creek C 165 Husted’s Landing 013 Woodcliff Lake 064 Palmyra Cove 115 Alloways Creek F 166 M.R. (Burcham) 014 Oradell Reservoir 065 Pemberton 116 Galloway 167 Seabreeze A 015 Palisades B 066 Camden County 117 Great Bay Blvd. 168 M.R. (Somes Drive) 016 Lake Hopatcong A 067 Westmont 118 Grossup 169 Patcong (Lower) 017 Picatinny/Lake Denmark 068 Medford 119 Lake Lenape 170 Seabreeze B 018 Lake Hopatcong B 069 Eagle Point 120 Canton Sheep Farm 171 Sayre’s Neck A 019 Mount Hope Lake 070 Woodbury Creek 121 Mad Horse Creek 172 Sayre’s Neck B 020 Paterson 071 Mantua Creek A 122 Devil’s Gut 173 Bay Point Road A 021 Parsippany 072 Timber Creek 123 Stow Creek G 174 Bay Point Road B 022 Overpeck Creek 073 Forked River 124 Stow Creek F 175 Nantuxent Creek A 023 Merrill Creek 074 Mond’s Island 125 Stow Creek E 176 Bear Swamp 024 Far Hills/Ravine Lake 075 Dupont/Raccoon Creek 126 Stow Creek D 177 Tuckahoe B 025 Great Swamp 076 Mantua Creek B 127 Stow Creek C 178 Tuckahoe A 026 Kearny 077 Bridgeport 128 Stow Creek A (North) 179 Nantuxent Creek D 027 Linden 078 Gibbstown 129 Shiloh Tower 180 Nantuxent Creek B 028 Stanton Station 079 Ferry Road Tower 130 Sunset 181 School House 029 Milford Tower 080 Waretown 131 CC Co Imp Auth 182 Beaver Dam 030 Three Bridges 081 Chatsworth 132 South River-Atlantic 183 Turkey Point A 031 Duke (Raritan River) 082 Swedesboro (Birch Creek) 133 Miry Run 184 Warfle 032 Manville 083 Stone Meetinghouse 134 Newport Meadows D185 M.R. (Mauricetown) 033 Johnson Park 084 Turnersville 135 Newport Meadows C186 Turkey Point B 034 Edison Tower 085 Penns Grove 136 Newport Meadows A187 Dividing Creek A 035 Bull’s Island 086 Oldman’s Creek 137 Newport Meadows B188 Fortescue A 036 Lambertville Tower 087 Deepwater 138 Davis Mill 189 Dividing Creek B 037 Old Bridge 088 Blue Anchor 139 Newport Meadows E 190 Port Norris 038 Keansburg 089 Cedar Run (Ocean) 140 Wheaton Island 191 Matts Landing 039 McClee’s Creek 090 Pennsville 141 Cohansey (Greenwich A) 192 Cedar Swamp Creek 040 Hartshorne Woods Park 091 Marshalltown 142 Cohansey (Sheppards Mill) 193 Heislerville 041 Pennington 092 Pilesgrove 143 Cohansey (Loatman) 194 Belleplain 042 Princeton 093 Salem River 144 Cohansey (Hopewell East)195 Riggins Ditch 043 Navesink River/Reservoir 094 Upper Oldmans 145 Cohansey CC A 196 Sadie Lane 044 Parker’s Creek 095 Silver Lake 146 Maurice River (Millville North) 197 Egg Island 045 Oceanport Creek 096 Mannington A 147 Bayside A 198East Point 046 Trenton 097 Penns Neck A 148 Bayside B 199 Dennis Creek 047 Mercer County GC 098 Daretown 149 Hancock A 200 South Dennis 048 Upper Millstone 099 Supawna Meadows B 150 Cohansey (Middle Marsh D) 201 Fishing Creek 049 Harvey Brook 100 Penns Neck B 151 Cohansey (Greenwich B) 202 Rio Grande 050 Manasquan Reservoir 101 Harris (Salem) 152 Cohansey (Hopewell West) 203 Cold Spring 051 Shark River 102 Seabrook 153 Cohansey (Hopewell Central) 204 Higbee. 2018 Season Highlights Telemetry Endangered and Nongame Species Program biologists, with the Conserve Wildlife Foundation, have attached satellite transmitters on several eagle fledglings over the past four years. In 2018, no new fledglings were tagged, but one four year old (subadult) was tagged after a short period in rehabilitation. “EagleTrax” mapping shows the movements of all these eagles, and can be found on the Conserve Wildlife Foundation of NJ’s website, http://www.conservewildlifenj.org/protecting/eagle-trax/ In 2018, Eagle Project vet Dr. Erica Miller and volunteer John Fox did an evening rescue of three eagles that fed on a dead fox, and ended up near-death. The three eagles were captured and immediately went into treatment for poisoning at Tri-State Bird Rescue and Research. One eagle died the next day, but the other two responded to treatment. One of them, a four year old, became our choice to carry a refurbished satellite tag; he would be of interest as an older bird likely to settle in southern NJ to nest, and also to track the success of a rehabilitated eagle. As a four year old bald eagle, he has a mostly white head, but still has a mix of brown feathers in his head and tail. “Pedro,” banded E/62, was named for Pedricktown, where he was found. Since his release on April 29, Pedro ranged around the Oldman’s, Raccoon, and Mantua creeks, and inland to abandoned cranberry bogs and other wetlands. During 2018, two eagles previously tagged in NJ stopped transmitting signals. “Nacote” (D/95) was banded as a nestling in June 2014 and fledged in July. Just weeks after fledging he made a big northern movement in August, 2014, heading due north and out of transmission range. He returned to northern New York where his transmitter’s data downloaded to our computers, showing he’d spent most of the fall in a remote area of Quebec. He returned to southern NJ in November, 2014, and spent the rest of 2015, 2016 and 2017 in Atlantic, Cape May, and Cumberland counties. He had been photographed several times at Forsythe NWR in Atlantic County. 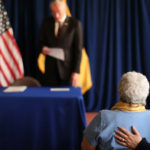 In the beginning of January 2018, Nacote was in Cape May County. His transmitter began to fail and we received fewer data transmissions. The last transmission was recorded on January 23, but we expect that he is still flying in the wild. In 2013, we tagged “Haliae” (D/88) as a Merrill Creek nestling. She fledged and spent the winter of 2013-14 ranging around northern Chesapeake Bay in MD. In April 2014, she headed through PA and NY and into Canada. In June she was back in NJ’s Warren County, though she continued to wander and spent that summer in northern Maine and Canada. In fall 2014, she headed to eastern PA, and spent most of 2015, 2016 and part of 2017 on Maryland’s eastern shore. In fall 2017 she ranged around eastern PA and northern MD, generally in the Susquehanna River watershed. On April 12, 2018, she was photographed along the Susquehanna River in Darlington, MD, which showed that one of the harness straps looked to be broken. Despite this, we continued to get normal signals indicating her movements around Chesapeake Bay for five more months. The last known location occurred on September 22, where the signal stopped; then another transmission from the same site on October 22 suggested the transmitter was not moving. Eagle Project volunteers Jeff and Cathy White offered to search the last known location in a woodland in Whiteford, MD. New Jersey Bald Eagle Project Report, 2018 18 They were able to find the transmitter and torn harness on the ground, with no sign of Haliae. She is no doubt flying free and possibly on the verge of her first nesting season. “Harmony 2” is the last nestling tagged with a transmitter that is still working. Harmony 2 (banded D/64) fledged in 2012 and spent her first winter on lower Chesapeake Bay before traveling to Maine. She has spent the last six years in a 100-mile swath of western Connecticut and Massachusetts, suggesting she will end up nesting there. On May 8, 2018, she was photographed in Marlboro, Vermont. These tagged eagles are helping us to identify good eagle habitat and overnight roost areas with more precision. Depending on funding, we will continue to use satellite tags on NJ eagles to help us understand habitat use and eagle distribution. Potential Nest Sites Biologists and observers actively searched for possible nesting eagles in several locations. The searches were in response to reports of eagles engaging in breeding behaviors. Areas that remain promising are Batsto Lake, Oswego Lake, Indian Mills Lake, Williamstown, Evesham, Flemington/Raritan River, Canoe Brook Reservoir, White Lake, Musconetcong River and middle Delaware River, all of which have year-round eagle activity. In addition, several inland reservoirs in the north hold promise for eagle nesting. Resightings of Banded Eagles Resightings of NJ (green) banded eagles have increased over the years, as well as eagles seen in NJ that were banded in other states. In Table 3, we list the eagles resighted in recent years in our state and, in some cases, surrounding states. These resightings, accumulated with the help of many photographers and birders, provide insight into eagle movements during the years between fledging and settling into a territory, as well as adult birds at a nest site. The list of resightings in Table 3 is ordered by the bird’s identifier, mostly the color band code. For some individuals, we have multiple resightings that provide some history and a story of that bird’s movements. New Jersey-banded eagles have been observed at nests in Pennsylvania, New York, and Connecticut. There are six cases of New York-banded eagles at NJ nests, and one of a Connecticut-banded eagle. There are at least five known NJ-banded eagles documented at nests within our state. The nesting pair at Ravine Lake includes a green-banded NJ female (unknown code) and a red/black-banded NY male (A/18). This male was released as part of a hacking project in New York City in 2005. The resighted eagles from the surrounding states clearly show that eagles move around the midAtlantic and northeast states. The majority of eagles are not marked with bands, and many states don’t maintain a banding program, so the small proportion of banded birds are a sample by which we can interpret eagle survival and movements in and around our state.